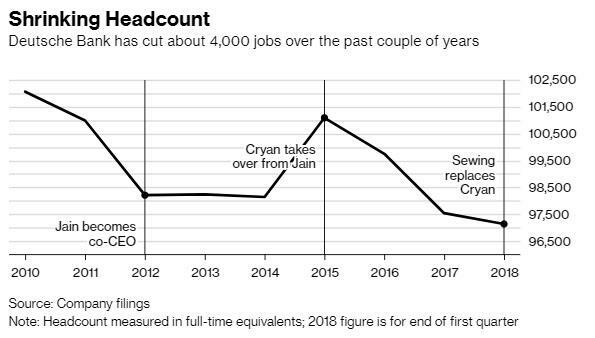 Well that escalated fast: one month after Bloomberg reported that Deutsche Bank would cut 1,000 jobs in the US, roughly 10% of its total US labor force, as part of new CEO Christian Sewing's restructuring process, the WSJ this morning writes that executives at the biggest German lender have "zeroed in" on plans to eliminate close to 10,000 jobs, about one in 10 employees, as part of the bank's epic cost-cutting scramble. The latest plan, part of a process that has divided senior executives and left investors unconvinced, "would extend into 2019, follows months of thorny debate over how fast and deep job losses should be at the beleaguered German lender." So far investors remain unconvinced the plan will work, and as a result the bank’s shares have fallen by nearly a third this year, making DB stock one of the worst performing European stocks, and at its lowest since a crisis of confidence hit the bank in late 2016. Meanwhile, high-level clashes over staffing and budgets and conflicting opinions from outside investors and bank executives reveal the depth of Deutsche Bank’s continuing struggles. As the WSJ adds, the bank's supervisory board and senior executives will confront investors Thursday in Frankfurt at its annual shareholder meeting. They will face a proposal to break up the company and probing questions about last month’s chief executive handoff and the tough choices the lender has to make. Separately, Bloomberg report that the bank is about to "retreat from a swathe of equities markets across the world, including some on its own doorstep in Europe." Germany’s biggest lender, which is expected to announce a range of restructuring measures to coincide with its annual shareholder meeting Thursday, will sharply reduce its presence in the U.S. market, and has also started cutting activity in the Central Europe, Middle East and Africa region, the people said, asking not to be identified discussing private information. In case it wasn't clear, it has been a messy year for Deutsche Bank. The April 8 ouster of CEO John Cryan in the middle of his management contract shook employees and appeared botched to some clients and investors. Things could get messier on Thursday, when Deutsche Bank’s chairman, Paul Achleitner, will face a vote of no-confidence, which could thrust Germany’s biggest bank into outright crisis after years of underperformance and strategic flip-flops. The shareholder meeting will convene as Deutsche struggles to convince investors that it has a credible strategy, under the leadership of chairman Paul Achleitner and Christian Sewing, the new chief executive he appointed in chaotic circumstances last month. 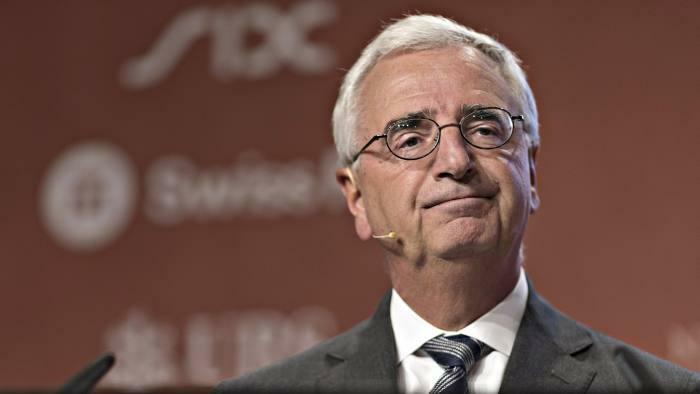 Among the potential names to replace Achleitner is Philipp Hildebrand, the former chief of the Swiss central bank, who currently heads Blackrock’s business in Europe. He quit the SNB after his wife was embroiled in a major FX insider trading scandal. In other words, Hildebrand should fit right into the "culture" at Deutsche Bank.